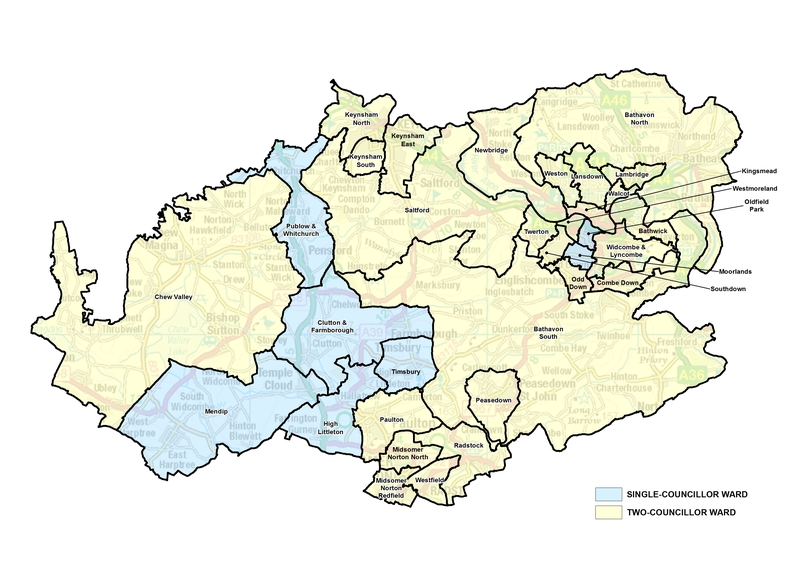 The independent Local Government Boundary Commission for England has published its final recommendations for new ward boundaries across Bath and North East Somerset. Today’s publication follows three phases of public consultation and draws new boundaries for each council ward across Bath and North East Somerset. The Commission’s final recommendations propose that Bath and North East Somerset should be represented by 59 councillors in the future: six fewer than the current arrangements. The recommendations also propose that those councillors should represent twenty-six two-councillor wards and seven one-councillor wards. The proposals mean that 28 current wards will change with nine staying the same. Professor Colin Mellors, Chair of the Commission, said, “We are extremely grateful to people across Bath and North East Somerset who took part in the review. The Commission has looked at all the evidence that was put forward during the consultations. In response to local feedback during the latest phase consultation, the Commission has changed some of the proposals it put forward in May. To the north of Bath city, the Commission has made minor changes to the proposals so that all properties on Fairfield Park Road will be part of the Lambridge ward rather than Walcot ward as previously proposed. In addition, local people argued that the whole of Hedgemead Park should be part of Walcot ward rather than divided with Lansdown ward. The Commission has also listened to local views to ensure that the Chelsea Road shopping centre is wholly part of the Newbridge ward rather than forming a boundary between Kingsmead and Newbridge wards. The change reflects that the area is a community focal point rather than a dividing line between neighbourhoods. In its final recommendations, the Commission maintains its proposal that the University campus at Claverton Down should, as it does currently, form part of Bathwick ward. The proposals also maintain the Combe Down community in a single ward. However, local people and organisations proposed that the Woodland Grove area should also be part of the Bathwick ward as it shares community ties. The Commission has made that change to reflect local opinion. In the south west of the city, the Commission has made a minor change to the boundary between its proposed Westmoreland and Oldfield Park wards so that a small area of Albert Crescent and Western Terrace will be in Westmoreland ward rather than Oldfield Park. To the north of Bath city, local people objected to the Commission’s draft recommendation to exclude Bathampton parish from Bathavon North ward. Respondents to the consultation described close links between other parishes in Bathavon North ward, particularly Batheaston and Bathford parishes. The Commission found the evidence compelling and now includes Bathampton in Bathavon North ward. As a result of this change, the Commission has added Claverton, Monkton Combe and South Stoke parishes to Bathavon South ward. To the south of the city, Camerton parish argued that it should be part of Bathavon South ward rather than Radstock ward. The Commission has agreed with the evidence presented to it and has changed its recommendations as well as adding Marksbury parish to Bathavon South ward so that it is included with other rural areas. This leaves a one-councillor Radstock ward which is unchanged from the current arrangements. The electoral review of Bath and North East Somerset Council is a separate undertaking from the review of parliamentary constituency boundaries which is being carried out by a separate body (Boundary Commission for England) under different rules and legislation. Full details of the Commission’s final recommendations (including maps) can be viewed at: https://consultation.lgbce.org.uk/node/9913.